Fortnite‘s latest update was expected to drop on April 9, 2019, but it has been officially confirmed in a tweet that it will launch on April 10, 2019. Server downtime will begin at 5 am ET. It is unclear how long the server downtime will run for, as full details and times were not provided. Also, the full list of patch notes will be revealed tomorrow, but it has already been confirmed that update 8.30 will bring with it a few features that you may recognize if you’ve ever played played Respawn Entertainment’s Apex Legends. Get ready for a new van and cards. It is no surprise that Apex Legends has seen massive success since its launch in February 2019, reaching 50 million players in only its first month. As such, it is only fitting that Fortnite would copy one of its more successful ideas. 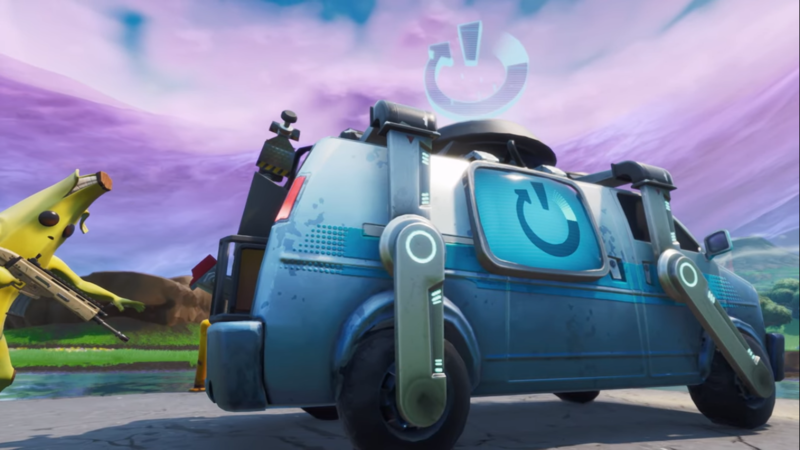 Fortnite players can look forward to the addition of the Reboot Van, and Reboot Cards when Fortnite‘s 8.30 Update drops. The Reboot Cards will function similarly to Apex Legend‘s Player Banners. When a teammate is killed you can collect their Reboot Card, then take it to a Reboot Van (of which there will be several throughout the map) to respawn them into your game for another attempt at Victory Royale. It has been stated that nearby players will be notified when someone is rebooting teammates. Be sure to provide your freshly rebooted teammates with some weaponry and shield potions, as they will be an easy target once they return to the land of the living. Fortnite‘s previous update brought with it a new temporary game mode titled “The Floor is Lava” where hot lava gradually spread throughout the map. This would force players to fight for the high ground to survive. A bunch of new items were available to forage, including Bananas that restore 5 health upon consumption, Coconuts that add 5 health over a short time, and Peppers that granted players 5 health and a 20% increase to movement speed for 10 seconds. Stay tuned for the full patch notes on Fortnite‘s 8.30 update!